This article contains the boss guide for Yaldabaoth. Yaldaboth, also known as the Demiurge, is the final boss in Persona 5. He has a variety of attacks but when fighting Yaldabaoth, he's easy to take down. This article contains the boss guide and strategy guide for Yaldabaoth in Persona 5 [P5]. So, Persona 5 just went a little Shin Megami Tensei with Yaldabaoth, god of secrets as the big baddie. Well, just like Masayoshi Shidou, he has two phases. The first phase is when he shows up as the Holy Grail. The second is he goes all Devil May Cry – Sanctus style and turns into a large, angry angel. He also summons a variety of weapons that can wipe your team clean off the board. Katherine Baskerville’s Notes: I’m a bit paranoid when I take down bosses. So, I made sure I was armed to the teeth with abilities and persona. Some people may have done it on a lower level but if you want an easy walk in the park, farming the World of Qliphoth is easier than most palaces. Each dungeon crawl granted me at least 1 level up. Will of the People Fully recover the Holy Grail when supply lines are present. Arrow of Light Heavy Almighty damage to 1 foe. Diffraction Arrow Medium Almighty damage to random foes. Low chance of Forget. Light Edge Heavy Almighty damage to all foes. Gathering Light Charge for Eternal Light. Eternal Light Colossal Almighty damage to all foes after preparing with Gathering Light. 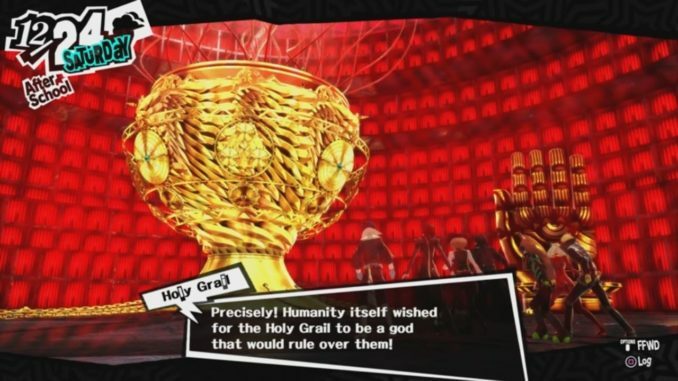 Yaldabaoth first appears as the Holy Grail where he’s connected to the will of all those in the cells. Whenever he heals up, he uses the attack known as “Will of the People”. For his main attack, he either uses Arrow of Light, Diffraction Arrow, Light Edge, and Eternal Light. One of the cues for Eternal Light is when he starts using Gathering Light. It takes one turn before he decides to blow you to pieces. On the first time, just use plain attacks. Send someone to cleave the veins fueling the Holy Grail. For this case, I sent Ryuji (’til this day, not sure how a mace can cleave but it works). With that, have Makoto, you and, Morgana attack the grail until Ryuji cleaves it off. It’ll take at least 3 turns. When he finally does then, you can step up the attack. Ryuji should have at least Charge, Matarukaja, and God’s Hand/Agneyastra. Makoto and Morgana will function as your healers. Makoto can rotate between attack and healing using Mediarahan, Diarahan, or Atomic Blast. Morgana must have Samarecarm and Salvation. If you have Trumpeter, use Debilitate on the first turn. After that, have Ryuji cast Matarukaja, Makoto can attack, and Morgana as well. Once the attacks come in, heal every time your HP drops to at least 40%. Rotate Morgana and Makoto on attacks using Garudyne and Atomic Blast respectively. Have Ryuji use Charge and then use God’s Hand which can deal at the most 6,000 damage (I clocked it at 6825 damage for a single God’s Hand). You can also attack using Satan after Debilitate, using Concentrate and breaking him with Black Viper. Once he’s done, he moves into the second phase. I have an issue, my level is 65 (party is around that, low being 63 and high being 67), I have no sp items, and no save slots even close to the grail fight. It is incredibly hard to fight the final boss, any thoughts? How do i survive his huge charged attack after he ressurrects all his gadgets to full health? I have no sp items and im in level 73 i find it hard to beat the last boss and id stuggled alot what can i change? I would do this, but… I used my only Soma at the end of Mementos, thinking I would figth the final boss… and I haved after doing so… and now I’m about to fight the final boss… neither Morgana, Ann, or Makoto at high enough SP to heal. The only SP restore items I have are 22 Mystery Soup. Is that enough? I’m level 78 just beat him… No one died… he’s rather simple sadly… just keep your health over 50% and your fine. I suggest you get Spellmaster and transfer it to a healing persona like maybe Michael, Lakshmi, or whoever. That way, the SP cost for the healing drops by 50%. You won’t need to rely too much on HP heals after that. At the same time, that’s what Morgana and Makoto are for. Morgana’s the main healer with Makoto being secondary. If you maxed out the Strength Arcana, you should be able to summon persona of a higher level. It’s how I managed to summon Michael and Satan despite being level 85. I… think so? As long as you have the skills. Yaldabaoth doesn’t really have much elemental skills. That’s what Morgana and Makoto are for. They are meant to heal and buff up your characters. If you have Matarukaja and Marakukaja, it’ll be as helpful as a Heat Soul or Thermopylae (only works if surrounded). However, it will take more time and SP especially when your cost doubles. If you need a good debuff, I suggest running Rakunda at least. It has low SP which can allow you to spam it easy. You can also rely on Yoshitsune to deal heavy damage. It all worked! 😀 Thanks.